Urban Simplicity: Some like it hot! If you've been to this blog prior then you know that I have been somewhat fascinated with the art of fermentation for sometime (click here), so this recipe should not come as a surprise. 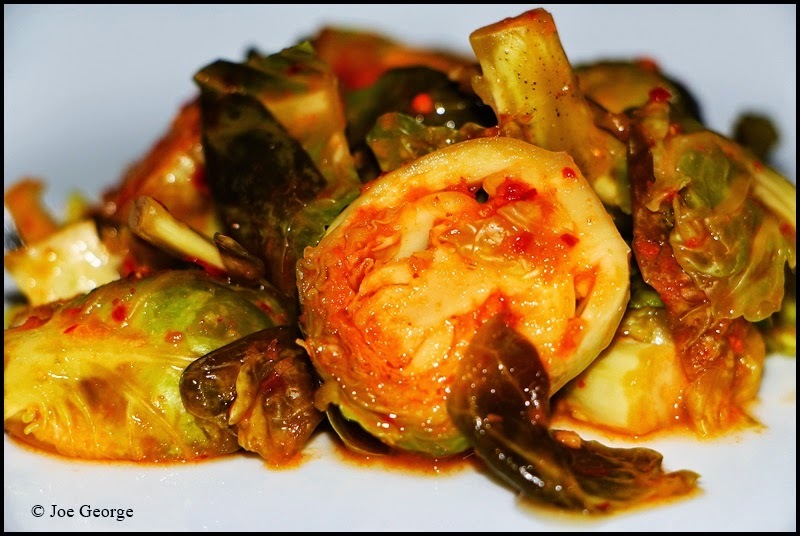 I initially got the idea when I came across a recipe for brussels sprouts kimchi at the website of Bon Appetite. Intrigued, I tried it but changed it up a bit to fit my tastes. Anyhow, it is really good (and really spicy) and easy to make. If you like fermented foods I hop you try this recipe (which is below). Place the brussels sprouts in a large bowl, dissolve the 7 ounces salt in the 4 quarts water and pour it over the brussels sprouts. Allow them to soak for one hour, then drain and rinse them, discarding the water. Combine in a blender, the onion, scallions, garlic, crushed pepper, soy sauce, Sriracha, ginger, coriander, and fennel. Then puree until smooth. Pour the spice mixture over the brussels sprouts in a large bowl, combining throughly, then transfer them to a gallon-sized glass jar. Mix the remaining 2 quarts of water and 1½ ounces salt together—allowing the salt to dissolve, and pour it over the brussels sprouts. Gently press the brussels sprouts to release any air pocket, but making sure that the vegetable is covered by an least a half-inch of liquid. Put a small plate or other object on the vegetable to keep them submerged. Cover the jar with a lid. Either leave the lid ajar or poke a small hole in it to allow the release of pressure and bubbles as it the kimchi ferments. Leave the jar at room temperature for about 5 days, or until it is bubbling and tastes slightly sour, then refrigerate. 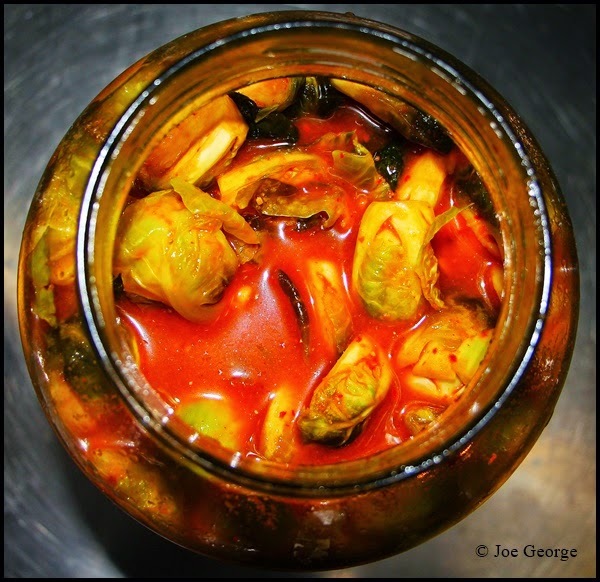 The brussels sprouts kimchi will keep for months in refrigeration.